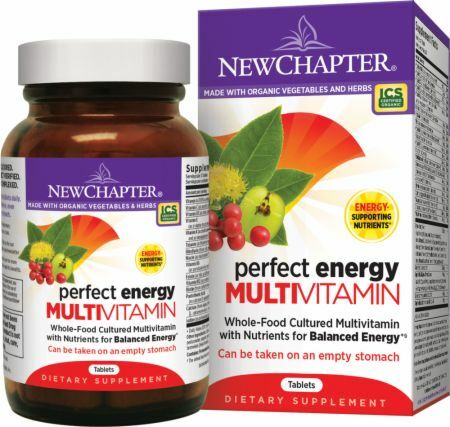 New Chapter Perfect Energy Multivitamin at Bodybuilding.com - Best Prices on Perfect Energy Multivitamin! Perfect Energy is an ideal whole-food fermented multi formulated with nutrients to help maintain your healthy energy balance, since even marginal nutrition depletion can affect energy levels. * Can take anytime, even on an empty stomach. Select blends of complementary herbs long used traditionally include organic Maca, organic Green Tea, and organic American Ginseng. No Perfect Energy Multivitamin Reviews Found. Directions For Perfect Energy Multivitamin: Three tablets daily. Can be taken anytime, even on an empty stomach. Not recommended for use in children. Warnings: As with any dietary supplement, you should advise your healthcare professional of the use of this product. If you are taking medication, or are nursing, pregnant, or considering pregnancy, you should consult your healthcare professional prior to using this product. Discontinue use and contact your healthcare professional if you experience a side effect or an allergic reaction. Do not exceed suggested use. Keep out of reach of children.